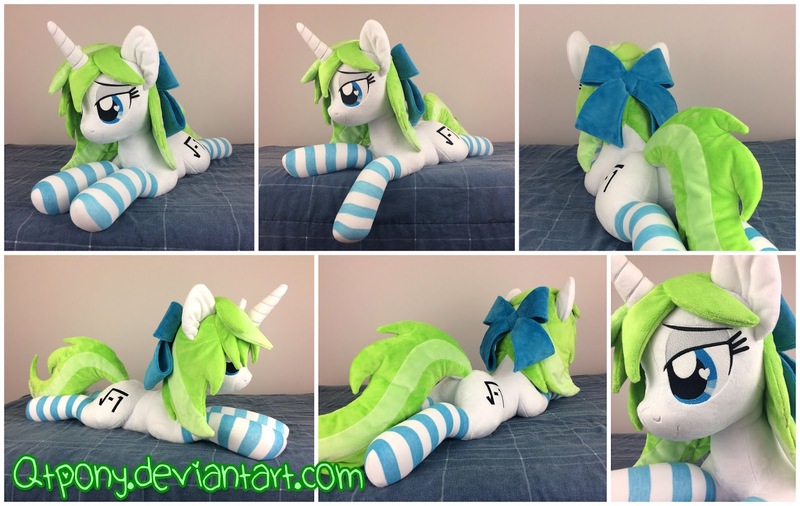 The last few years has seen the rise of the life-size pony plushie market, with many an artist adding the option to their commission list for people that aren't happy with a simple 12 inch decorative pony for their shelves. It's a booming market, and just about all of them have almost year-long wait lists. Where Hasbro fails to deliver, the fandom can barely keep up! 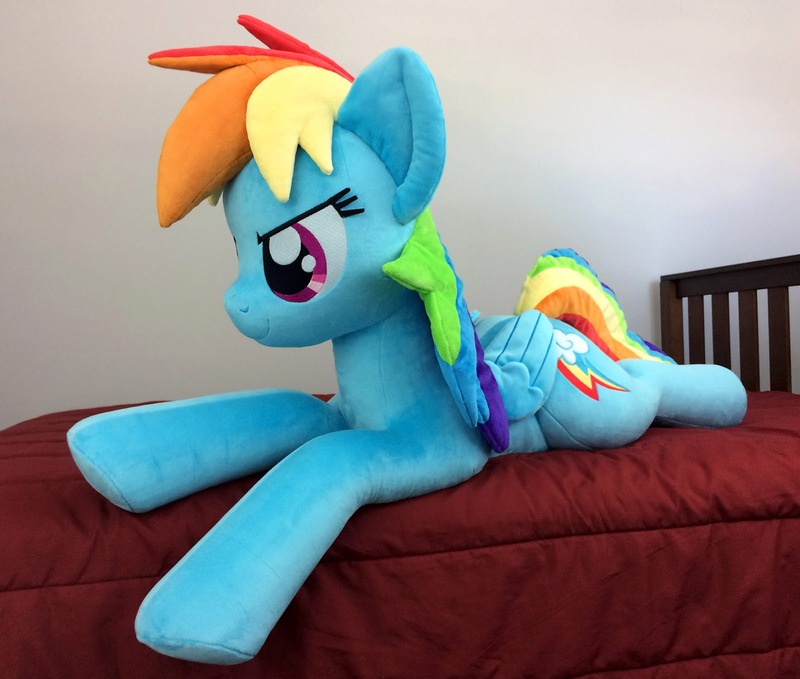 One crafter in particular has spent the last few years absolutely perfecting the plushie equine form. Every stitch painstakingly placed to make sure the curves are just right. Qtpony is one of the most sought after artists in the fandom because of it. Everything from fuzzy, realistic manes to tiny details like docks and hoof impressions have been added, with improvements on every plushie. So, how do they do it? How did they get here? Head on down below for the interview and gallery in another Artist Spotlight! I was aware of MLP:FIM for a couple years before I got into the show but I kind of just brushed it off as some silly thing. However I decided I'd eventually check it out to see what the hype was about in 2014, and ended up getting hooked somewhere in the middle of watching the first season. Q:) What is the process you usually go through when crafting a new plushie? What tools and, if any, programs do you use? The very first thing I do when making a new character is to try to conceptualize how exactly I'm going to make them, more specifically their mane and tail. Some ponies have some pretty complex manes to create in 3D space, and it always helps me a ton to look at other plushies to see how different people approach it. As for programs, I do almost all of my pattern work in Adobe Illustrator, I do some drawing work in Photoshop, and create my embroidery designs using Embird. I use way too many physical tools to start listing those off though! Q:) Do you do this professionally? Or is it a side thing to another career or job? I've always considered it to be just a hobby of mine, although over time it's become more or less a full time thing that I make a living off of. Q: ) Who is your favorite pony and favorite princess? And if it's different, which pony has been your favorite to make? My favorite pony is Twilight Sparkle, so she'd also be my favorite Princess, though I really like Princess Cadance too. 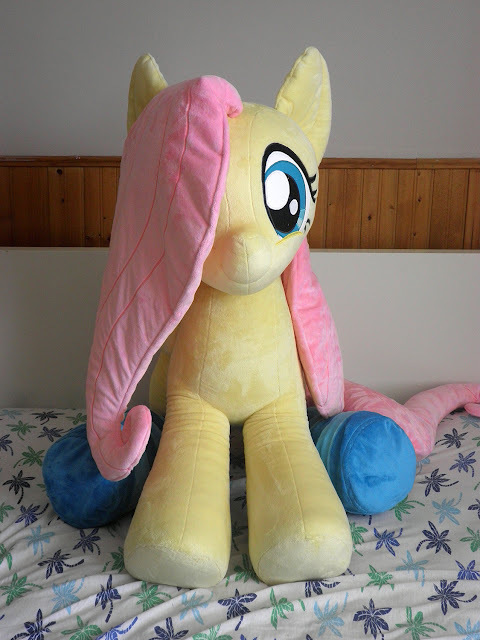 Despite that, my favorite pony to make is Fluttershy. She's quite simple to make, and I think her personality gets captured so well in plush form. You know, like being soft and cuddly. Q:) What kind of challenges do you usually run into when using a new body pattern or different mane, tail, and accessories? Has there ever been a concept that completely stumped you? Scaling patterns up and down can be a challenge, proportions can change which requires a lot of testing and tinkering with sizes of certain pieces such as the ears to get them to look right. As for something that has stumped me in the past, that'd be making removable clothing. Pony anatomy is really challenging to work around in that regard. Q:) Lifesize and laying down seems to be the major plushie style people want these days. How has this affected your workload? Are these a lot more time consuming to craft compared to a regular standing pony for you? I've always been a lifesize plush maker even from the very beginning, so in that regard my workload hasn't changed any, although the laying down plush trend is very real, it seems like that's all people want these days. I consider it a welcome change though, they're actually quite a bit easier to make than a standing up pony since they just lay down on my desk while I'm working on them and all I ever have to do is spin them around. With the big standing up ones I always have to keep them propped over something so they don't fall over which is really annoying. Q:) You seem to have mastered the curvy pony everything. So much so that someone actually bid $1000 just for the ability to commission you. That’s some serious cartoon plushie animal magnetism right there. 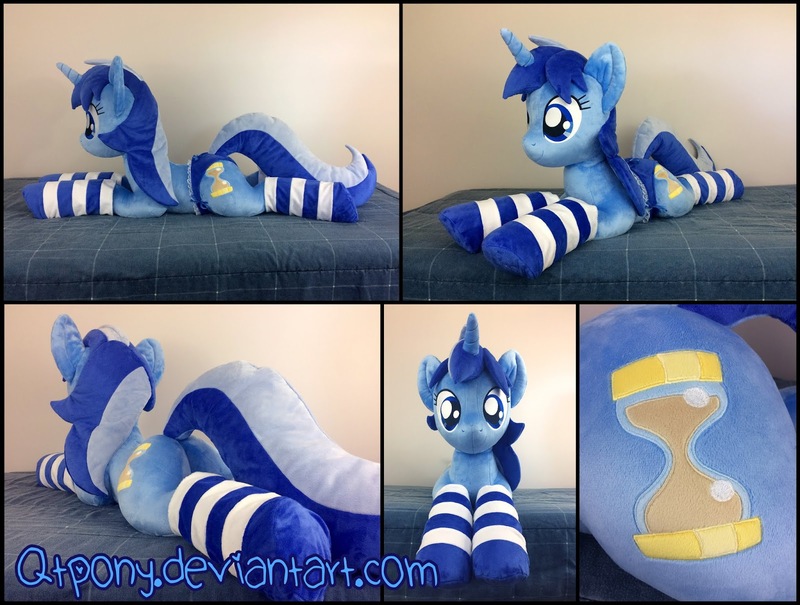 How long did it take to create such an appealing plushie model? Were there a ton of failed attempts or did it all come together pretty smoothly? I'm glad my efforts haven't gone unnoticed! It's definitely what I strive for ;) There is probably more behind the scenes with making tests and constant adjustments than most people think to achieve good looking patterns. With a brand new pattern, the first couple design iterations never come out good at all, and I may go through a dozen test plushies before I'm satisfied enough with the shape to start making complete plushies using the design. From there, I make small changes between most of the plushies I make to try improving them gradually over time. Q:) Socks, sweaters, silly hats, swimwear, full body armor, ponies have worn it all. What is your favorite accessory to create for ponies? And if it’s different, what do you think they look best in? Socks are definitely my favorite, they aren't too hard to make but add so much to the character. A couple times I've even made some socks for a commissioned plush even if they didn't ask for any since I thought they'd look better with them haha. Other than that, I like making hats, even if sometimes ponies manes can get in the way and make putting the hat on their head a challenge. Q:) What do you like most about Friendship is Magic? What keeps you making so many awesome plushies? I've always loved the art style and how expressive and cute these ponies can be. I can't think about stopping while there are so many different ponies that I haven't made yet, you know? Q:) Do you have any tips for newbie plushie makers looking to improve? It's all about trial and error, and you can't let yourself get too discouraged. Realize that nobody gets things perfect the first time around and everyone has to go through the same process. Also don't be afraid to experiment and try new things. Sometimes a crazy new idea will work great, and other times it won't and it will ruin the plush you're working on. That's just how it goes! I think the strong community has definitely played a big part in its continued success, and all the great people I've met along the way keeps me around enjoying the show and fandom. QtPony's Gallery can be found over here if you want more! You can Commission them over here!